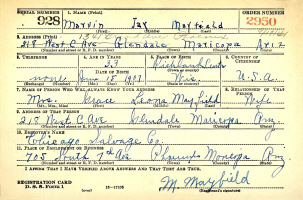 Marvin Jay Mayfield was born June 15, 1907, in Orion Twp., Richland Co., WI, and died August 28, 1978, in International Falls, Koochiching Co., MN, at age 71. Buried in Forest Hill Cemetery, International Falls, Koochiching Co., MN. He is the son of Cyrus Lorin Mayfield of Richland Co., WI, and Iva May Abbey of Aldine Twp., Norton Co., KS. Grace Leona Bristol was born March 8, 1907, in Watonwan, Brown Co., MN, and died October 1, 1983, at Good Samaritan Memorial Hospital, Phoenix, Maricopa Co., AZ, at age 76. Buried in Louis B. Hazelton Memorial Cemetery, Buckeye, Maricopa Co., AZ. She is the daughter of Raymond Vernon "Ray" Bristol of Ohio, and Virginia "Virgie" Hoover of Wisconsin. Marvin Jay Mayfield (about age 26) and Grace Leona Bristol (about age 26) were married about 1931 in Richland Center, Richland Co., WI. Howard Lee Mayfield: Born September 10, 1931, in Richland Center, Richland Co., WI; Died Tuesday, August 2, 1966, while swimming in Canyon Lake, Maricopa Co., AZ (age 34). Buried in Louis B. Hazelton Memorial Cemetery, Buckeye, Maricopa Co., AZ. Married to Lois Ledell Darling: Born July 5, 1936, in Unknown. Beverly Bea Mayfield: Born March 29, 1932, in Richland Center, Richland Co., WI; Died June 15, 1977, ten miles south of Casa Grande on Interstate Highway 10, Pinal Co., AZ (age 45). Buried in Louis B. Hazelton Memorial Cemetery, Buckeye, Maricopa Co., AZ. Married August 17, 1951, in Phoenix, Maricopa Co., AZ, to Laurence Daniel "Poop" Hardesty: Born December 25, 1927, in Buckeye, Maricopa Co., AZ; Died June 15, 2015, in Litchfield, Maricopa Co., AZ (age 87). Buried in Louis B. Hazelton Memorial Cemetery, Buckeye, Maricopa Co., AZ. Buddy Mayfield: Born about 1935 in Richland Center, Richland Co., WI; Died after 1940 in Unknown. Marvin Jay Mayfield Jr.: Born July 26, 1937, in Baraboo, Sauk Co., WI; Died July 24, 1941, in St. Joseph's Hospital, Phoenix, Maricopa Co., AZ (age 3). Buried in Greenwood Memory Lawn Cemetery, Phoenix, Maricopa Co., AZ. Janet L. Mayfield: Born May 10, 1942, in Arizona. Married before 1966 in Unknown to Lorne Knose: Born Unknown. 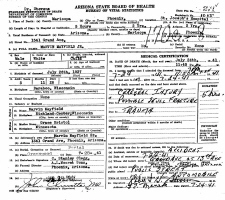 Marvin Jay Mayfield and Grace Leona (Bristol) Mayfield were divorced June 23, 1943, in Phoenix, Maricopa Co., AZ. Grace Leone (Bristol) Mayfield then married Charles David McEnnis. 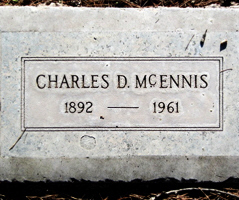 Charles David McEnnis was born January 9, 1892, in Franklin, Simpson Co., KY, and died November 24, 1961, at the home of his brother, in Phoenix, Maricopa Co., AZ, at age 69. Buried in Greenwood Memory Lawn Cemetery, Phoenix, Maricopa Co., AZ. He is the son of Charles L. McEnnis of Pennsylvania, and Agnes Blackburn Brawner of Kentucky. Charles David McEnnis and Grace Leona (Bristol) Mayfield were married about November, 1946, in Unknown. Charles David McEnnis and Grace Leona (Bristol) (Mayfield) McEnnis had unknown children. Charles David McEnnis and Grace Leona (Bristol) (Mayfield) McEnnis were divorced before 1961 in Arizona. Marvin Jay Mayfield then married Leona Delene Servis. Leona Delene Servis was born March 20, 1926, in Dunseith, Rolette Co., ND, and died July 22, 2009, at Littlefork Care Center, International Falls, Koochiching Co., MN, at age 83. Buried in Forest Hill Cemetery, International Falls, Koochiching Co., MN. She is the daughter of Fred R. Servis of Cadillac, Wexford Co., MI, and Ingrid "Inga" Landskverk of Seljord, Telemark Co., Norway. Marvin Jay Mayfield (age 40), a divorcee, and Leona Delene Servis (age 21), a maiden, were married February 3, 1948, in International Falls, Koochiching Co., MN. Dennis Clinton Mayfield: Born September 11, 1946, in Minneapolis, Hennepin Co., MN; Died November 26, 2007, in International Falls, Koochiching Co., MN (age 61). Married August 26, 1972, in International Falls, Koochiching Co., MN, to Beverly A. Rooker: Born July 4, 1953, in Unknown. Annette Jean Mayfield: Born January 23, 1954, at Falls Memorial Hospital, International Falls, Koochiching Co., MN. Married (1) to John E. Larson: Born Unknown; Died Unknown. Divorced February 17, 1982, in International Falls, Koochiching Co., MN. Married (2) March 19, 1983, in International Falls, Koochiching Co., MN, to Michael Ray Timberman: Born about 1953 in Unknown. Alan Dean Mayfield: Born February 4, 1956, in International Falls, Koochiching Co., MN. Married February 7, 1976, in International Falls, Koochiching Co., MN, to Julie Ann Vigoren: Born about 1958 in Unknown. Debra Ann "Debbie" Mayfield: Born September 4, 1957, in International Falls, Koochiching Co., MN; Died October 17, 2006, at Falls Memorial Hospital, International Falls, Koochiching Co., MN (age 49). 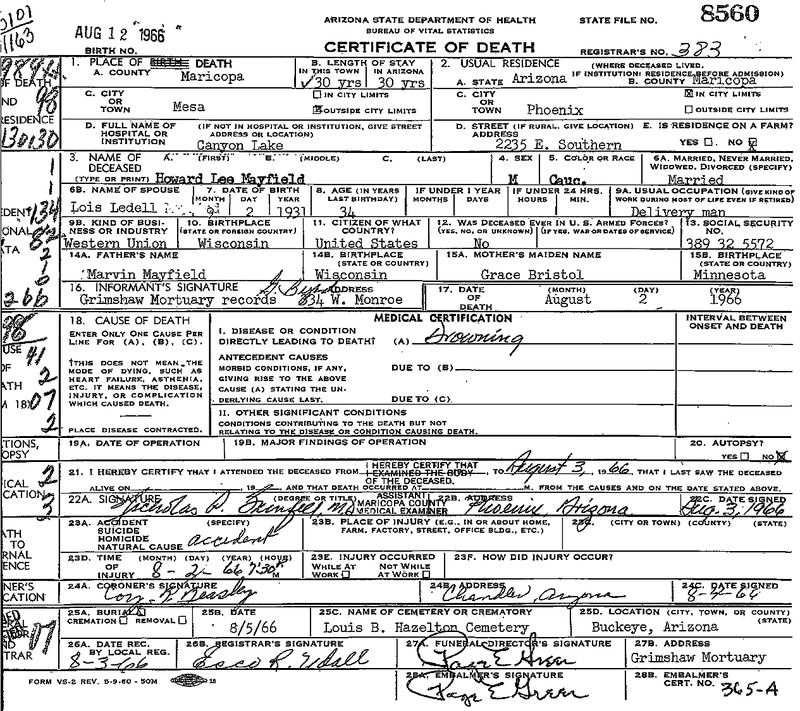 Married (1) August 9, 1982, in Ramsey Co., MN, to Joseph "Joe" Csomos Sr.: Born November 3, 1931, in Hungary; Died August 8, 1988, in International Falls, Koochiching Co., MN (age 56). Debra and Joseph were divorced January 17, 1984, in Koochiching Co., MN. Married (2) to Mark Richard Oglesby: Born Unknown. Leona Delene (Servis) Mayfield then married Harry Ernest Stevens. Harry Ernest Stevens was born September 12, 1918, in Halliday, Dunn Co., ND, and died January 27, 1994, at the Veterans Administration Medical Center, Minneapolis, Hennepin Co., MN, at age 75. Buried in Mizpah Cemetery, Mizpah, Koochiching Co., MN. He is the son of John "Jack" Stevens of Perry, IA, and Bertha Mae Conklin of Shell Lake, Becker Co., MN. Fred William Dudley was born April 13, 1891, in West Fork, Washington Co., AR, and died September 25, 1959, in Hennepin Co., MN, at age 68. Buried in Forest Hill Cemetery, Anoka, Anoka Co., MN. Winnifred Elizabeth Collins was born March 16, 1917, in the Village of Long Prairie, Todd Co., MN, and died May 18, 1976, in Crow Wing Co., MN, at age 59. Buried in Forest Hill Cemetery, Anoka, Anoka Co., MN. She is the daughter of Michael Collins of Minnesota, and Elizabeth Jane "Lizzie" Wood of Ohio. 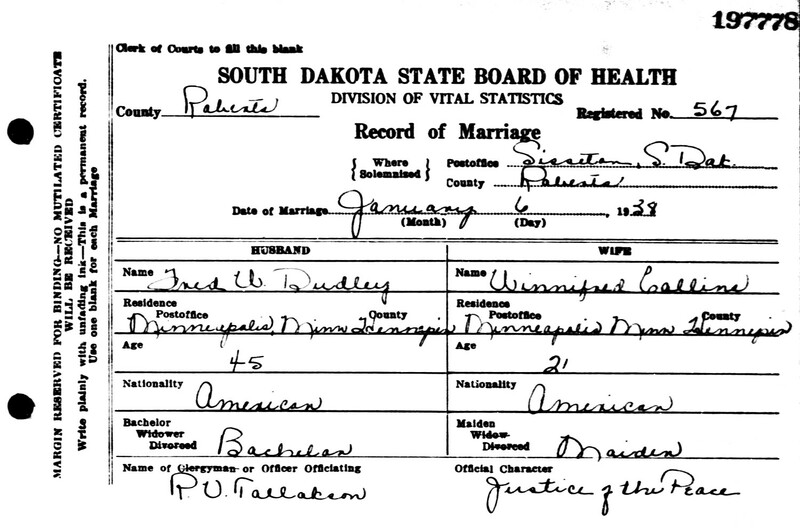 Fred William Dudley and Winnifred Elizabeth Collins were married January 6, 1938, in Sisseton, Roberts Co., SD. Fred William Dudley and Winnifred Elizabeth (Collins) Dudley had Unknown children. Harry Ernest Stevens and Winnifred Elizabeth (Collins) Dudley were married September 30, 1967, in Anoka Co., MN. Harry Ernest Stevens and Winnifred Elizabeth (Collins) (Dudley) Stevens were divorced June 13, 1972, in Beltrami Co., MN. Harry Ernest Stevens and Leona Delene (Servis) Mayfield were married August 17, 1981, in International Falls, Koochiching Co., MN. Harry Ernest Stevens and Leona Delene (Servis) (Mayfield) Stevens had no children. Harry Ernest Stevens and Leona Delene (Servis) (Mayfield) Stevens were divorced August 20, 1987, in International Falls, Koochiching Co., MN. Charles David McEnnis is buried in Greenwood Memory Lawn Cemetery, Phoenix, Maricopa Co., AZ. Thanks to Find-A-Grave for making this image available. 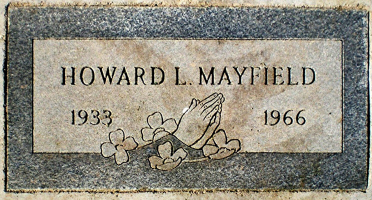 Howard Lee Mayfield is buried in Louis B. Hazelton Memorial Cemetery, Buckeye, Maricopa Co., AZ. Thanks to Find-A-Grave for making this image available. Beverly Bea (Mayfield) Hardesty is buried in Louis B. Hazelton Memorial Cemetery, Buckeye, Maricopa Co., AZ. Thanks to Find-A-Grave for making this image available. Charles David McEnnis was born January 9, 1892, in Franklin, Simpson Co., KY.
Marvin Jay Mayfield was born June 15, 1907, in Orion Twp., Richland Co., WI. Grace Leona Bristol was born March 8, 1907, in Watonwan, Brown Co., MN. The 1910 U. S. Census taken on April 29, 1910, shows Cyrus L. Mayfield (age 32) born in Wisconsin to Wisconsin-born parents is a farmer owing his home and living in Orion Twp., Richland Co., WI. He has been married for eleven years to Iva Mayfield (age 31) born in Kansas to Canadian and Wisconsin-born parents. All five of her children were born in Wisconsin and are living at home: Melva Mayfield (age 10); Lucie Mayfield (age 6); Lesly Mayfield (age 5); Marvin Mayfield (age 2); and Thelma Mayfield (age 9/12). Elijah Mayfield and family (Cyrus' parents) live on the adjacent farm. Salome (Blake) Pugh and family also lived nearby. The 1910 U. S. Census taken on May 2, 1910, shows Ray Bristol (age 26) born in Illinois to Illinois-born parents is a General Farm Farmer renting his farm in Mulligan Twp., Brown Co., MN. Living with him is his wife of 7 years, Virgie Bristol (age 27) born in Wisconsin to Indiana and Wisconsin-born parents with 4 of the 5 children born to her still living. Also living there are their children, all unmarried and born to Minnesota to Illinois and Wisconsin-born parents: Pearl Bristol (age 6); Hazel Bristol (age 4); Grace Bristol (age 3); and Fern Bristol (age 4/12). Harry Ernest Stevens was born September 12, 1918, in North Dakota. The 1920 U. S. Census taken on January 8, 1920, shows Cyrus L. Mayfield (age 42) born in Wisconsin to Wisconsin-born parents is a Farmer owning his own farm in Orion Twp., Richland Co., WI. Living with him is his wife, Iva M. Mayfield (age 40) born in Kansas to Canadian and Wisconsin-born parents. His five children are also living at home, all born in Wisconsin: Lucile V. Mayfield (age 16); Leslie W. Mayfield (age 14); Marvin J. Mayfield (age 12); Thelma Mayfield (age 10); and Ruby E. Mayfield (age 4). The 1920 U. S. Census taken on January 21, 1920, shows Ray V. Bristol (age 35) born in Illinois to Illinois-born parents is a Farmer renting his farm in Eagle Twp., Richland Co., WI. Living with him is his wife, Virgie Bristol (age 36) born in Wisconsin to Illinois and Wisconsin-born parents. Also living there are their children, all unmarried and born to Illinois and Wisconsin-born parents: Pearl Bristol (age 16) born in Minnesota; Hazel C. Bristol (age 14) born in Minnesota; Grace L. Bristol (age 12) born in Minnesota; Nelie Bristol (age 10) born in Minnesota; Harold C. Bristol (age 8) born in Minnesota; Melvin B. Bristol (age 5) born in Wisconsin; Glan V. Bristol (age 2-4/12) born in Wisconsin; and Grant L. Bristol (age 4/12) born in Wisconsin. Leona Delene Servis was born March 20, 1926, in Dunseith, Rolette Co., ND. Laurence Daniel "Poop" Hardesty was born December 25, 1927, in Buckeye, Maricopa Co., AZ. Laurence Daniel "Poop" Hardesty Birth Records. The 1930 U. S. Census taken on April 6, 1930, shows Cyrus L. Mayfield (age 52) born in Wisconsin to Wisconsin-born parents is a dairy farmer owning his own farm in Orion Twp., Richland Co., WI. Living with him is his wife, Ivy M. Mayfield (age 51) born in Kansas to Canadian and Wisconsin-born parents. They were married at ages 22 and 20 respectively. Also living at home are two Wisconsin-born children: Marvin J. Mayfield (age 22); and Ruby E. Mayfield (age 14). The 1930 U. S. Census taken on April 19, 1930, shows Ray V. Bristol (age 45) born in Illinois to Illinois and United States-born parents and first married at age 18 is a Teamster for the County Highway owning his own home on Sextonville Road, 1st Ward, City of Richland Center, Richland Twp., Richland Co., WI. Living with him is his wife, Virgie Bristol (age 46) born in Wisconsin to Indiana and Wisconsin-born parents and first married at age 19. Also living there are his children, all unmarried and born to Illinois and Wisconsin-born parents: Grace L. Bristol (age 23) born in Minnesota; Harold C. Bristol (age 18) born in Minnesota; Melvin B. Bristol (age 15) born in Wisconsin; Glen V. Bristol (age 13) born in Wisconsin; Grant L. Bristol (age 10) born in Wisconsin; and Keith E. Bristol (age 6) born in Wisconsin. 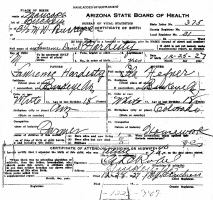 Mrs. Pearl B. Lawton was the census enumerator. Ray was born January 13, 1885, in Illinois and died June 26, 1962, in Richland Center, Richland Co., WI. Virgie (Hoover) Bristol: Born June 30, 1883, and died November 20, 1965, in Richland Center, Richland Co., WI. Marvin Jay Mayfield (about age 24) and Grace Leona Bristol (about age 24) were married 1931 in Richland Center, Richland Co., WI. 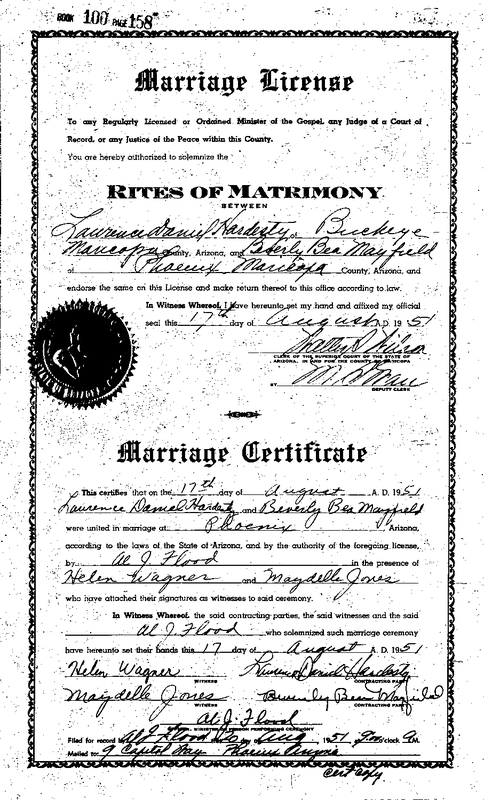 Fred William Dudley and Winnifred Elizabeth Collins Marriage Record. 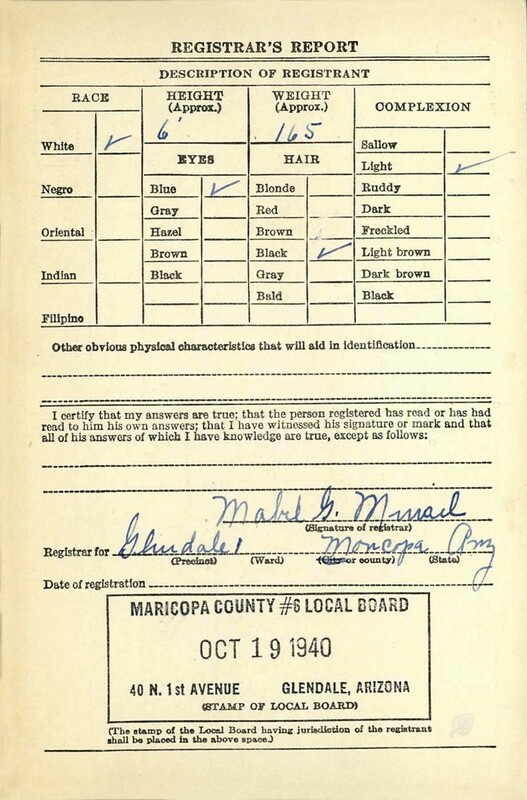 The 1940 U. S. Census taken on April 9,1940, shows Marvin Mayfield (age 33) born in Wisconsin, and 5 years ago was living in Richland Center, Richland Co., WI, and with 8 years of School, is a Farm Laborer, and is renting his home for $10/month, and is living at 218 West C. Avenue, Town of Glendale, Maricopa Co., AZ. Living with him are: his wife, Grace Mayfield (age 33) born in Wisconsin, and 5 years ago was living in Richland Center, Richland Co., WI, and with 8 years of School; his daughter, Beverly B. Mayfield (age 8) born in Wisconsin, and 5 years ago was living in Richland Center, Richland Co., WI, and with 1 year of School; his son, Buddy Mayfield (age 5) born in Wisconsin, and 5 years ago was living in Richland Center, Richland Co., WI; and his son, Marvin Mayfield Jr. (age 2) born in Wisconsin. 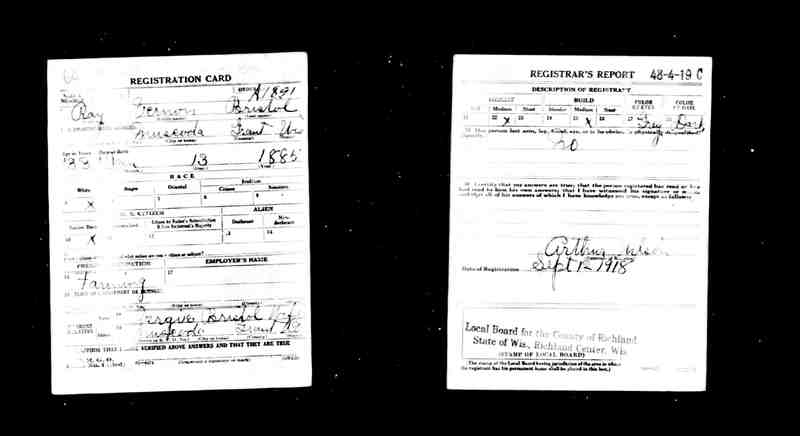 The WWII Draft Registration Report dated October 19, 1940, shows Marvin Jay Mayfield (age 33) born June 15, 1907, in Richland Center, WI, is employed by Chicago Salvage Company. His nearest relative is his wife, Mrs. Grace Leona Mayfield. 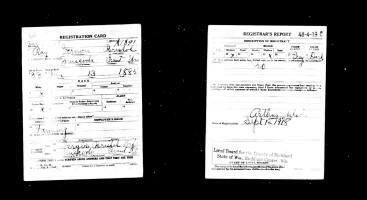 The WWII Draft Registration Report for Marvin Jay Mayfield. 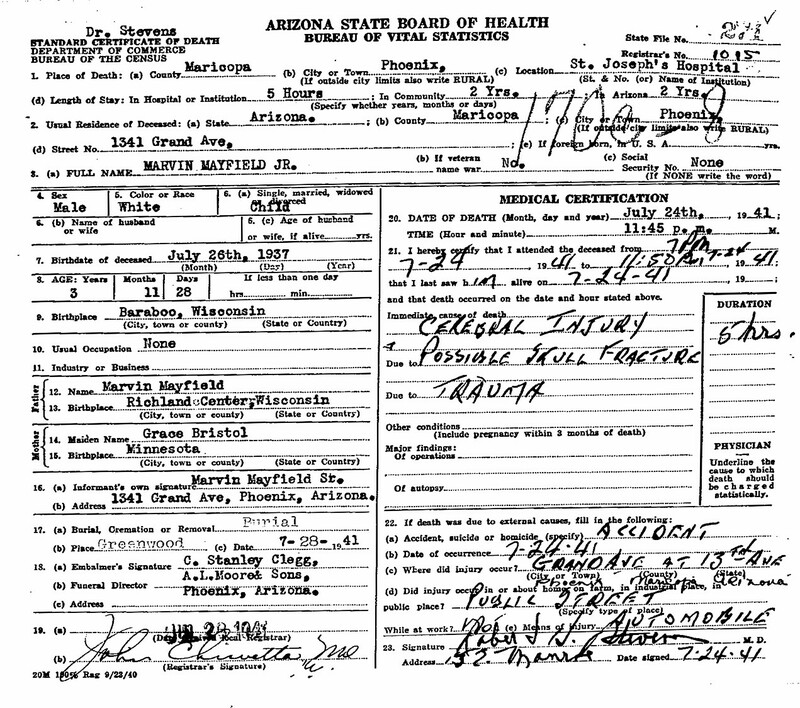 Marvin Jay Mayfield Jr. died July 24, 1941, in St. Joseph's Hospital, Phoenix, Maricopa Co., AZ, at age 3. Buried in Greenwood Memory Lawn Cemetery, Phoenix, Maricopa Co., AZ. 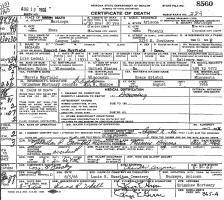 Marvin Jay Mayfield Jr. Death Record. 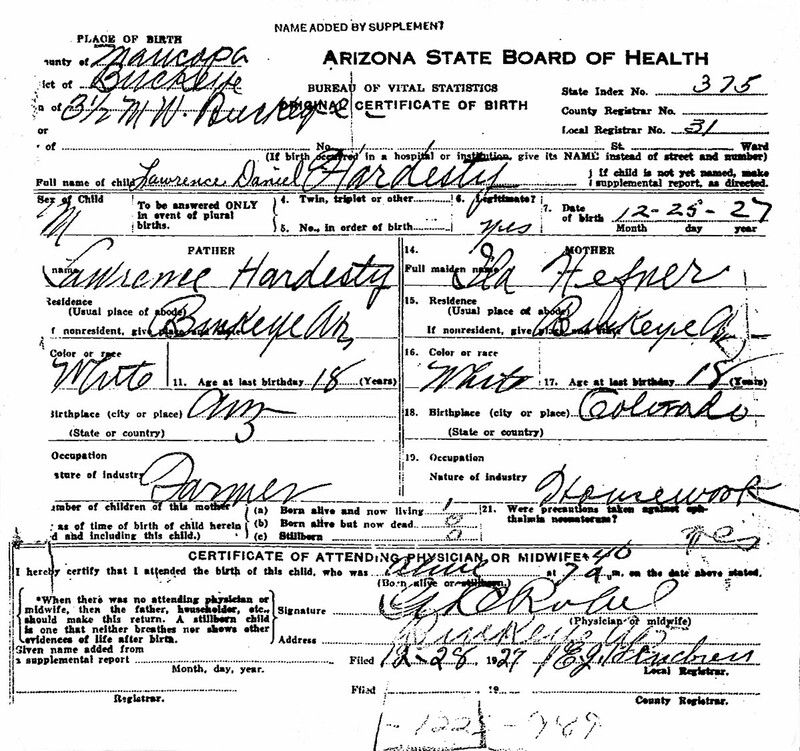 Laurence Daniel "Poop" Hardesty (age 23), a bachelor, and Beverly Bea Mayfield (age 19), a maiden, were married August 17, 1951, in Phoenix, Maricopa Co., AZ. 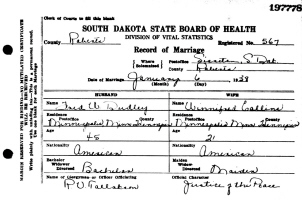 Laurence Daniel "Poop" Hardesty and Beverly Bea Mayfield Marriage Record. 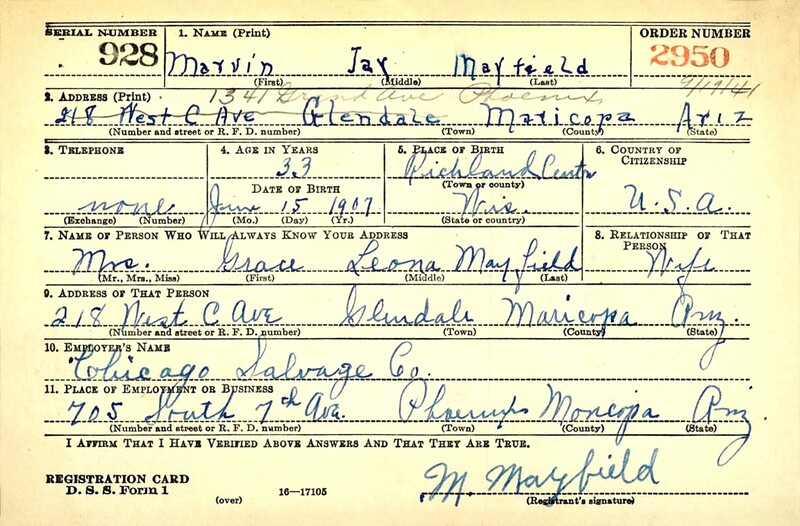 Marvin Jay Mayfield and Grace Leona (Bristol) Mayfield were divorced June 23, 1943, in Maricopa Co., AZ. 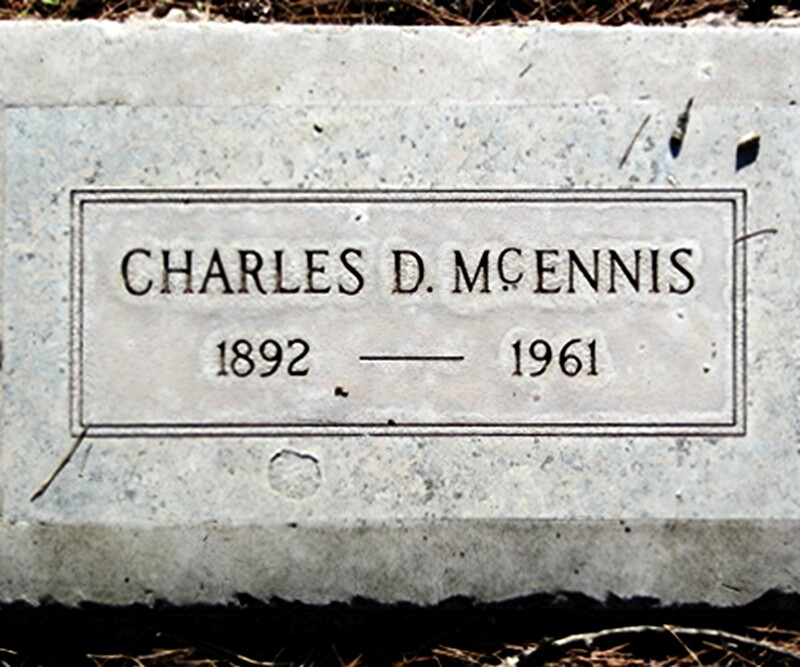 Charles David McEnnis died November 24, 1961, in Phoenix, Maricopa Co., AZ, at age 69. Buried in Greenwood Memory Lawn Cemetery, Phoenix, Maricopa Co., AZ. 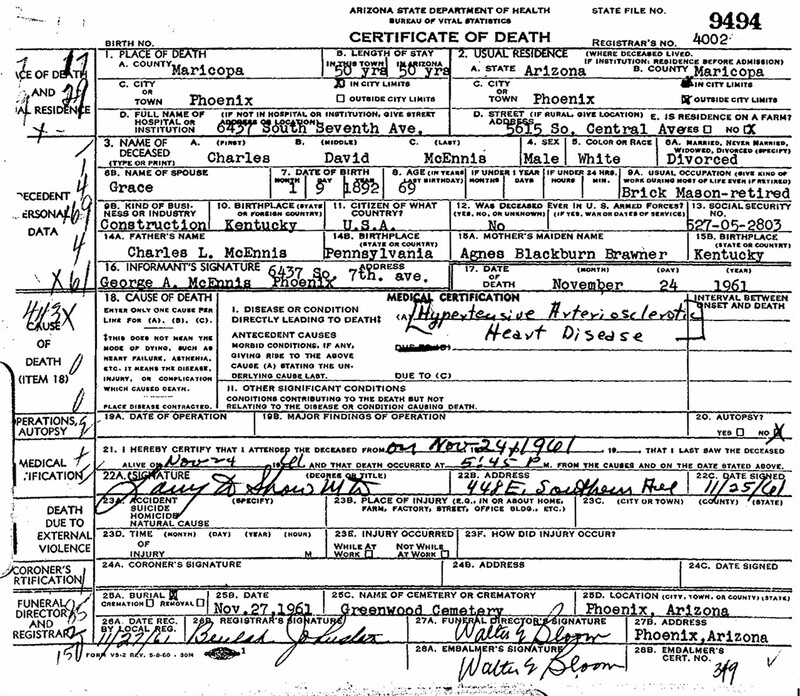 Charles David McEnnis Death Record. 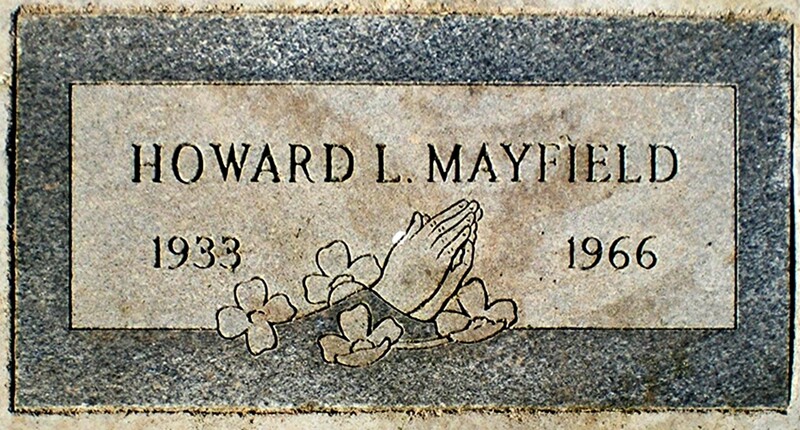 Howard Lee Mayfield died Tuesday, August 2, 1966, while swimming in Canyon Lake, Maricopa Co., AZ, at age 34. Buried in Louis B. Hazelton Memorial Cemetery, Buckeye, Maricopa Co., AZ. 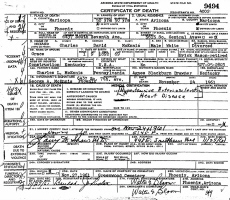 Howard Lee Mayfield Death Record. Phoenix Man Drowns in Lake. A 34-year-old Phoenix man drowned last night in Canyon Lake, the Maricopa County Sheriff's Department reported. He was identified as Howard Lee Mayfield, of 2235 E. Southern Ave. Deputy Bob Smith said Mayfield had been swimming at the lake with his family. After he had been missing for about 25 minutes, his body was recovered by Wayne Roof, 815 W. Pima, Coolidge. Services for Howard Lee Mayfield, 34, who drowned Tuesday at Canyon Lake, will be at 2 p.m. today at the Buckeye Church of Christ on Valencia Avenue in Buckeye. Burial will be in the Louis B. Hazelton Cemetery in Buckeye. Born in Richland Center, Wis., Mr. Mayfield had been an employe of the Phoenix Western Union Co. for 16 years. He lived at 2235 E. Southern. Survivors include his wife, Lois; two daughters, Debbie and Michelle, of Phoenix; his mother, Mrs. Grace McEnnis of Buckeye; two sisters, Mrs. Beverly Hardesty of Buckeye, and Mrs. Lorne Knose, out of state; and his parents-in-law, Mr. and Mrs. Roy Darling of Buckeye. Winnifred Elizabeth (Collins) (Dudley) Stevens died May 18, 1976, in Crow Wing Co., MN, at age 59. Buried in Forest Hill Cemetery, Anoka, Anoka Co., MN. Beverly Bea (Mayfield) Hardesty died June 15, 1977, ten miles south of Casa Grande on Interstate Highway 10, Pinal Co., AZ, at about age 45. Buried in Louis B. Hazelton Memorial Cemetery, Buckeye, Maricopa Co., AZ. A Buckeye woman was killed Wednesday when a vehicle driven by her daughter overturned miles south of Casa Grande on Interstate 10, the Department of Public Safety reported. Killed was Beverly Bea Hardesty, 45. Investigators said she was riding in a southbound recreational vehicle driven by Susan Hardesty, 17. Officers said the left front tire blew out and the vehicle ran off the road into a culvert, ejecting Mrs. Hardesty. Susan and another passenger, Stacy Slade, 3, of Buckeye, were treated at Hoemako Hospital and released, officers said. Marvin Jay Mayfield died August 28, 1978, in International Falls, Koochiching Co., MN, at age 71. Grace Leona (Bristol) (Mayfield) McEnnis died October 1, 1983, at Good Samaritan Memorial Hospital, Phoenix, Maricopa Co., AZ, at age 76. Buried in Louis B. Hazelton Memorial Cemetery, Buckeye, Maricopa Co., AZ. BUCKEYE - Graveside services for Grace Leona McEnnis, 76, who died Oct. 1, 1983, at Good Samaritan Medical Center, will be 4 p.m. Tuesday at Lewis B. Hazelton Memorial Park. Friends may call from 6 to 9 p.m. today at Buckeye Funeral Home. Mrs. McEnnis, of Buckeye, was born in Richland Center, Wis., and moved to Arizona 50 years ago. Survivors include her daughter, Janet Knouse; a brother; five grandchildren; and five great-grandchildren. Harry E. Stevens and Leona Delene (Servis) (Mayfield) Stevens were divorced August 20, 1987, in International Falls, Koochiching Co., MN. Harry Ernest Stevens died January 27, 1994, at the Veterans Administration Medical Center, Minneapolis, Hennepin Co., MN, at age 75. Buried in Mizpah Cemetery, Mizpah, Koochiching Co., MN. Keith E. Bristol died Monday, Sept. 22, 2003, at Pine Valley Healthcare and Rehab Center, Richland Center, Richland Co., WI, at age 80. RICHLAND CENTER - Keith E. Bristol, age 80, died on Monday, Sept. 22, 2003, at Pine Valley Healthcare with his family at his side following an extended illness with cancer. He was born on Aug. 20, 1923, in Richland County, the son of Ray and Virgie (Hoover) Bristol. The family moved to Richland Center in 1925, where Keith attended school, graduating from Richland Center High School in 1942. He was a student at the University of Wisconsin before enlisting in the Marine Corps. He was a paratrooper and was always proud to have been a Marine. After being wounded, he returned to Richland Center and was the business manager at Bristol Motors until his retirement. He looked after his parents until they passed away and then moved to "the farm" where he spent many happy years. His hobbies included stamp collecting, reading, carving, painting and gourmet cooking. He especially enjoyed his Stearman plane and giving rides in it. He loved his horses, spending time on "his" river - the Wisconsin River, and being with family and friends. He was a special uncle to his nieces and nephews and was like a brother to his niece, Janet Kraus. He especially appreciated the extra love and care he received from his niece, Sherill Anthony, and his nephew, Nick Bristol. In addition to his parents, Keith was preceded in death by three sisters, Pearl Merwin, Hazel Woolledge and Grace McEnnis; brothers, Robert, Roy and Howard as infants; a niece, Beverley Hardesty; and nephews, Harold King Jr., Marvin and Howard Mayfield, and Tommy Bristol. Survivors include a sister, Fern King of Mineral Point; brothers, Harold (Alice) Bristol of Lone Rock, and Melvin Bristol and Grant (Lola) Bristol of Richland Center; and several nieces and nephews. Because of illness, he had spent the last few years at Harvest Guest Home and Pine Valley Healthcare. The family deeply appreciates the special love and care that he received at each place - above and beyond expectations. Per Keith's request, there will be no funeral services. Pratt Funeral Service is assisting the family with their arrangements. 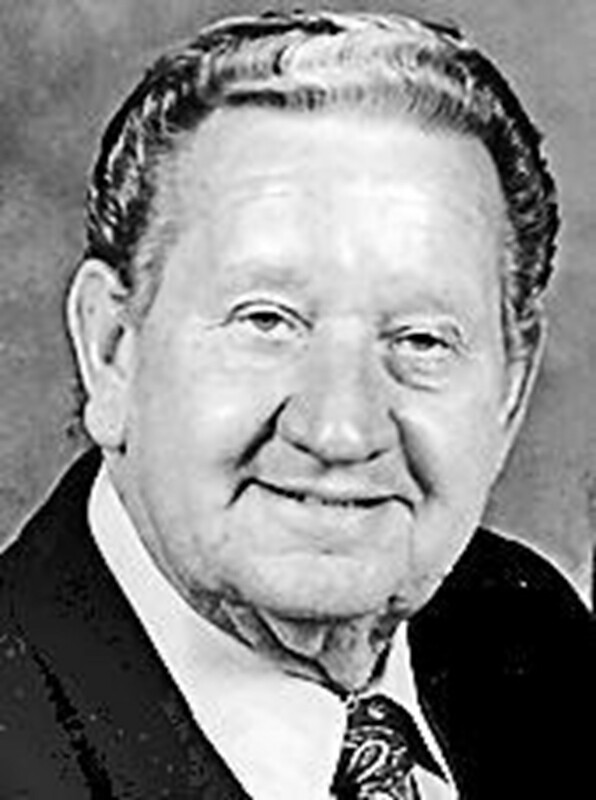 Melvin B. Bristol died Friday, Aug. 4, 2006, at Pine Valley Healthcare and Rehab Center, Richland Center, Richland Co., WI, at age 91. Debra Ann "Debbie" (Mayfield) Csomos died October 17, 2006, at Falls Memorial Hospital, International Falls, Koochiching Co., MN (age 49). Debra Ann Csomos, International Falls, Minn., died Tuesday, Oct. 17, 2006, at Falls Memorial Hospital. Debbie was born Sept. 4, 1957, to Marvin and Leona Mayfield in International Falls. She was a lifelong resident of the Falls and graduated from Falls High School in 1975. Following high school she studied for two years at Rainy River Community College. In the late 1980s she began working as a program director for Friends Against Abuse, and typically, she threw herself into her work quickly becoming the director. She brought a sharp focus to the nature of domestic violence to the community, and the importance of dealing with the issue effectively. She routinely received inquiries from all over the United States regarding her policies, and how such programs should work. Tough, but fair in work, was a measure of her integrity. But it was her compassion for others, especially those who were hurting, that enabled her to be so giving and selfless, even when she may have been suffering herself. In a time of material importance, being a key measuring tool, Deb may have come up a little short. In terms of "selfless" integrity however, she stood alone, occasionally against overwhelming odds; it was then she was at her best. She loved animals and helping people and above all else she adored her grandchildren and was a devoted grandmother. She was preceded in death by her father, Marvin Mayfield, and infant son, Christopher. Debbie is survived and will be missed by her mother, Leona Mayfield; long-term spouse, Mark Oglesby; son, Michael Csomos; daughter-in-law, Diandra Csomos; grandsons, Brandon and Dominic Csomos; stepchildren, Joe, Frank, Erika and Donlin Csomos; stepdaughter, Stefanie Oglesby; brother, Dennis Mayfield; sister, Annette Timberman; brother, Alan (Julie) Mayfield; sister-inlaw, Beverly Mayfield; and numerous nieces and nephews. A memorial service is scheduled for 10 a.m. Saturday, Oct. 21, at Green-Larsen Memorial Chapel, International Falls. Condolences may be left at www.greenlarsen.com. Arrangements are with Green- Larsen Mortuary Inc., International Falls. Debra ''Debbie'' Csomos, 49, of International Falls, died Tuesday, Oct. 17, 2006. She was born Sept. 4, 1957 in International Falls, Minn. FUNERAL SERVICE: 10 a.m. Saturday, Oct. 21, 2006 in the Green-Larsen Memorial Chapel in Int'l Falls. Arrangements by Green-Larsen Mortuary, Inc. www.greenlarsen.com Inc., International Falls. 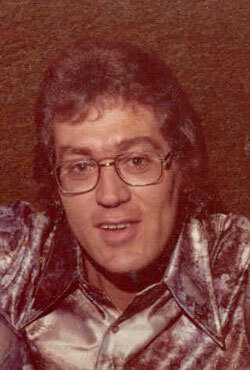 Dennis Clinton Mayfield died November 26, 2007, in International Falls, Koochiching Co., MN, at age 61. Dennis Clinton Mayfield, 61, International Falls, Minn., died Monday, Nov. 26, 2007 at St. Mary’s Medical Center, Duluth, Minn. Dennis was born Sept. 11, 1946 in Minneapolis, Minn., to Marvin and Leona Mayfield. He lived most of his life in the Falls. He was united in marriage to Beverly Rooker on Aug. 26, 1972 in International Falls. Dennis worked in the construction field. He loved the outdoors and enjoyed fishing and hunting. He was an avid reader and adored spending time with his family. He was especially proud of his sons and grandsons. He was preceded in death by his father, Marvin Mayfield; sister, Debbie Csomos; and two nephews, Adam Mayfield and Christopher Csomos. Dennis is survived by his mother, Leona (Servis) Mayfield of International Falls; wife, Beverly (Rooker) Mayfield of International Falls; sons‚ Jasen (Kristal) Mayfield and Jesse (Karla Erickson) Mayfield, both of the Falls; grandsons, Malachi and Kaden Mayfield; brother, Alan (Julie) Mayfield of International Falls; sister, Annette Timberman, also of the Falls; best friend, Barry Bieganowski; and numerous nieces and nephews. A private family service will be conducted at a later date. A memorial gathering for family and friends of Dennis is planned for 3 p.m. Friday, Nov. 30, at the Salvation Army Corp. Building, 1301 Third Ave. W. Condolences may be left at www.greenlarsen.com . Arrangements are with Green-Larsen Mortuary Inc., International Falls. Leona Delene (Servis) (Mayfield) Stevens died July 22, 2009, at Littlefork Care Center, International Falls, Koochiching Co., MN, at age 83. 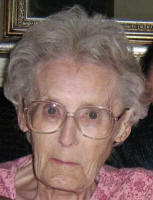 Leona Delene Mayfield, age 83, a resident of Littlefork Care Center, died Wednesday, July 22, 2009. She was born March 20, 1926, at Dunseith, N.D. The former Leona Servis was united in marriage to Marvin Mayfield. She worked for International Dry Cleaners and as a CNA at the Littlefork Medical Center. Her hobbies included cooking, sewing, playing dice, and spending time with her grandchildren. She was preceded in death by her parents, Fred and Inga Servis; husbands, Marvin Mayfield and Harry Stevens; son, Dennis; daughter, Debbie Csomos; grandsons, Adam Mayfield and Christopher Csomos; brothers, Roy and Sidney; and sister, Vivian Elliott. She is survived by children, Annette Timberman of Fort Dodge, Iowa, and Alan (Julie) Mayfield of International Falls; daughter-in-law, Beverly Mayfield of International Falls; grandchildren, Jason and Jesse Mayfield, Jeremy Larson, Andrea Cottrell, Josh, Kathy, and Scott Timberman, Ryan Mayfield, Sarah Morin, and Michael Csomos; 19 great-grandchildren; sister, Frances Eklund of Bemidji; step-daughters, Dolly and Connie; step-grandson, Mark Stevens; and special friend, Helen Trask of Littlefork. Funeral services will be conducted at 11 a.m. Saturday, July 25, at Green-Larsen Mortuary. Interment will be at Forest Hill Cemetery. Laurence Daniel "Poop" Hardesty died June 15, 2015, in Litchfield, Maricopa Co., AZ, at age 87. Buried in Louis B. Hazelton Memorial Cemetery, Buckeye, Maricopa Co., AZ. 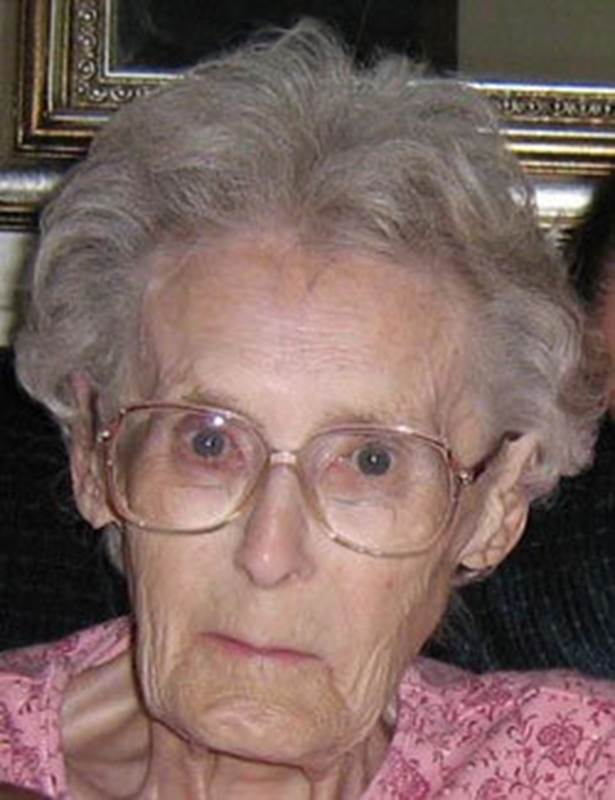 87, of Buckeye, AZ died June 15, 2015, in Litchfield, AZ. Born December 25, 1927, to Howard and Ila Hardesty in Buckeye, AZ. He was a lifelong farmer in the Buckeye Valley, learning the business from his Father and Grandfather who settled west of Buckeye in 1916. He was a loving husband, father and grandfather. He is survived by his loving wife, Gail. They were married for 38 wonderful years. Children; Susan and (Chuck) Troyer, Elisabeth and (Larry) Cooper, Dawn Hardesty, David and (Debbie) Hardesty, Kathy and (Gene) Shelton, and Blake Hardesty. Brother; George and (Aileen) Hardesty, Sister; Sue Hardesty; Sister-in-Law, Mary Hardesty. He was "Grandpa" to 12 Grandchildren and 16 Great Grandchildren. He was preceded in death by his brother Bruce Hardesty, and his first wife Beverly Hardesty. A celebration of L. D. will be held on July 11, 2015, 11am at The Verrado Country Club, Buckeye, AZ. In lieu of flowers the family suggest donations to The American Diabetics Association. Lawrence Blake Hardesty, 62, of Buckeye died Aug. 22, 2015, at his home. Mr. Hardesty was born Sept. 2, 1952, in Mobile, Ala., to Laurence and Beverly Hardesty. He graduated from Buckeye Union High School in 1970. He moved to Bangs, Texas, in 1990, where he worked and retired from Aldersgate Industries. He moved back to Buckeye in 2010. He is survived by his stepmother, Gail Hardesty; one brother, David Hardesty; and three sisters, Kathy Shelton, Dawn Hardesty and Susan Troyer. No services will be held. Harry E. Stevens, 75, of Blackduck, died Jan. 27, 1994 at VA Medical Center in Minneapolis. Funeral services were Tuesday at Snustad Funeral Home in Blackduck with Rocky Coffin officiating. Burial was in Mizpah Cemetery in Mizpah. Honorary pallbearers were Mark Stevens, Shawn McMahon, Paul Scheldrup, Chad Olson, Scott Timberman, Mark Pribula and Dan Friebohle. He was born Sept. 12, 1918 in Halliday, N.D. He came to Ponsford in 1919 and was raised there by Mr. and Mrs. Art Mayberry. In his teens he moved to Gemmell. He worked in the CCC camps, then at a lumber camp in Mizpah. He served in the Army during World War 11. After the service he worked for Mando Paper Company in International Falls for seven years then returned to Gemmell. In 1989 he moved to Blackduck. He was a member of the Northome American Legion and VFW. He is survived by three daughters, Margaret in Germany, Donna Scheldrup and Connie Olson, both of Blackduck; eight grandchildren; four great-grandchildren; one brother, Everett Stevens of Kelliher; one sister, Esther Weichselbaum of Gemmell; one foster sister, Ruby Schott of Ponsford; and a very personal friend, Leona. He was preceded in death by his parents; two sisters, Laura McGruder and Elsie Stevens.